RIO DE JANEIRO – With the first ball to be kicked in South Africa on Friday morning (11AM Brasilia time), player injuries, a supporter crush and referee controversy have hampered some World Cup preparations, but Brazil continued to look strong in their warm up games. 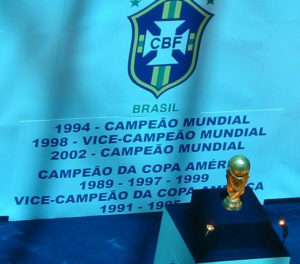 Brazil, the most succesful side in World Cup History, are looking for a sixth title in South Africa, photo by Wikimendia Creative Commons License. The national team took part in a monumental event last Tuesday when they became the first non-African team to play in Zimbabwe since 1980. Dunga’s men comprehensively defeated their hosts 3-0 in Harare with Michel Bastos, Robinho and Elano scoring the goals for a strong line up in preparation for their opening fixture against North Korea on June 15th. One worrying aspect was the lackluster performance of Kaká, who has clearly not fully recovered from the calf injury he suffered in training last week. With the possible absence of his most creative talent, Dunga’s decision to leave behind Ronaldinho Gaucho looks ever more risky and while the coach has repeatedly insisted on selecting substance over flair, there remains a shortage of match winners in his squad. Certainly Brazil’s youth coach Carlos de Lorenzi, who saw Ronaldinho play as a teenager in Porto Alegre, thinks the Milan player should be at the World Cup. “He is the only kid I’ve ever seen who basically smelt of World Cup material. He would tear the other kids apart. I don’t buy into the theory of work rate over talent. The absence of Ronaldinho cuts off options,” he told press last week. Brazil have a fresh injury worry in the form of goalkeeper Julio Cesar who missed the final warm up game against Tanzania on Tuesday June 7th having injured his back against Zimbabwe. 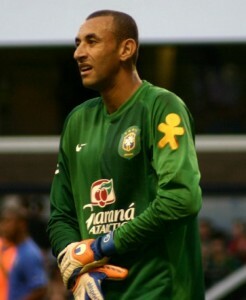 The Inter Milan stopper had not missed a Brazil match for two years, but was replaced by Tottenham Hotspur’s Gomes for Tuesday’s friendly. The goalkeeper had little to do as Brazil thrashed their opponents 5-1, and while Robinho and Ramires scored two goals each and Kaká also netting for the first time in a year for the seleção, the merit of games against such weak opposition must be questioned. Gomes had a comfortable game against Tanzania, but is unlikely to start against North Korea, photo by Idlan Zakaria/Wikimedia Creative Commons License. The niggling injuries to Kaká and Cesar were put into perspective by a host of other household names restricted to the sidelines for their respective countries. Brazil’s Group G opponents Ivory Coast lost their star player Didier Drogba to an elbow injury on Friday against Japan. The talismanic front man underwent surgery the following day, but it is still not known if he will be fit enough to play against Brazil on 20 June in the so called ‘Group of Death’. Portugal, perhaps Brazil’s biggest threat in that group, also lost a key man on Friday when Manchester United midfielder Nani, who was so ruthless in front of goal in qualifying, was ruled out with a collarbone injury. Drogba is not the only Chelsea player likely to miss the tournament. After a grueling club campaign that ended less than one month ago, Michael Essien, John Obi Mikel and Michael Ballack all miss the plane to South Africa with Ghana, Nigeria and Germany respectively. England coach Fabio Capello has also been handed a massive setback, with captain Rio Ferdinand sent home by team doctors on Friday having failed to overcome the back and hamstring problems that have hampered his season at Manchester United. Midfielder Steven Gerrard has taken the captain’s armband. With so many star players missing for their rivals, Brazil’s worries over the fitness of Kaká and Cesar begin to look less significant, and the absence of stars such as Ronaldinho and Adriano could be felt less keenly as a result, but all eyes remain on the squad to bring an astonishing sixth World title back to Brazil, and, just as importantly it seems, playing ‘beautiful’ soccer. Nice article to be fair on englands chances they didnt have any in the first place and Rio is very over-rated as the whole squad is. I hope North Korea scores goals this FIFA 2010~ (^___^) People who keep talking about the North Korean government/politics should really switch their wavelengths back to football. This is FIFA, HELLO~!!! So talk about football instead please.